Deep in the consciousness of all men is the awareness of the divine. With some, it is nearer the surface of the mind; in others it lies relatively unknown and undiscovered until some major event or stimulus awakens it from sleep. Thus some affirm readily the existence of the divine while many reject, often heatedly, the reality of all that cannot be known, measured and understood by their five senses. Today, many are sensing, more and more, the presence of Maitreya, Whose energies penetrate all the planes of consciousness. They may know not the name, or even of His existence, but, responding to His energy, are aware of a new and spiritual climate in the world. They find it difficult to explain but know with growing certainty that they live in the aura of the divine, and that all will be well. They know, too, that they are not alone, that their prayers are being answered, and that something wonderful and sacred is happening on planet Earth. They sense that the stressful and dangerous conditions of today are nearing their end, that beyond the fear and failures of our time is a new and better world to be fashioned and that it will be so fashioned. Meanwhile, Maitreya prepares to engage with all that hinders man’s progress and well-being, with all that prevents the expression of his divinity, and also with man’s own fear and frailty. He will show that man has come from the highest source and is equipped with all the potential of Gods; that, freed from the fear which holds him in thrall, man can build a civilization worthy of his divinity and creative genius. He will show that fear and lack of trust alone condemn men to the present dangerous conditions which threaten their existence; that the simple act of sharing will bring justice and peace to their troubled world; that men must recognize themselves as one, one group, sons of the one Father. Thus will He speak. Thus will He call on men to change. How will men respond? How will they find Maitreya’s analysis of their position and problems? Maitreya is not alone in urging change and reform in the world. Many wise men and women are responding to His thoughts and energy and propound, widely, His ideas. Slowly but surely, these ideas are taking root, and educating large masses of hitherto uninterested and uncommitted people. Thus is Maitreya’s way being prepared. Even so, how can Maitreya touch the hearts of the millions needed to change direction? The answer lies in the potency of His energies. Never before has a Teacher of such power stood before the world. With each word uttered, His beneficent force flows from heart to heart. Useless and unnecessary is argument and debate. His Truth calls forth the Truth in the heart of the listener, and in the crucible of their shared divinity is recognized as Truth Itself. Q. (1) On 16 July 2007 a 6.8 magnitude earthquake rocked the world’s largest nuclear plant at Kashiwazaki, Japan, causing a transformer fire and spills and leaks at the plant. (1) Was the nuclear leak in Japan worse than the government made out? (2) Was there any UFO activity over the area either before or after the damage caused by the recent quake? A. (1) Yes. (2) Yes, both before and after. Q. On Wednesday 1 August 2007 the 40-year-old bridge over the Mississippi river in Minneapolis, USA, collapsed during rush hour. Although there were over 70 people injured, the death toll was extremely low for such a disaster. A school bus full of children made what seemed like a miraculous escape, stopping inches away from the edge of the structure. Was there any intervention by the Masters to save lives in this accident? A. My Master confirms that the Master Jesus protected the school bus and that He and other Masters saved many lives in the incid­ent. Q. What would be the most effective way of tackling climate change; what measures would have the greatest impact? What are Hierarchy’s priorities with regard to saving the planet – given that it is such a complex issue? A. The cessation of tree-felling in huge areas of primal forest. Oxygen reserves are dangerously depleted by such wanton destruction of trees. Furthermore, trees (and the vegetable kingdom as a whole) are natural and powerful absorbers of carbon dioxide. All efforts to combat climate change must be co-ordinated on an international level. It is indeed a complex issue. Q. In May 2007 wildfires were experienced across America encompassing thousands of acres. Was this the result of karma and, if so, what exactly? A. No, they were the direct result of global warming which the US government finds difficult to accept, and still finds reasons to deny. Q. The US government plans to put a radar defence system in the Czech Republic and a missile system in Poland, claiming that it needs to counter a threat from Iran. Iran’s missiles could not reach Europe but the US claims that Iran is attempting to build a “Shahab-4” missile which could give it a possible 1,900 mile range. Iran rejects that suggestion, stating that it would only be to put satellites into orbit. This is creating a crisis between Russia and the US, with Russia threatening to aim its missiles at new targets in Europe or develop a new system to counter the threat posed by the US government. (1) Why is the US expanding its network of radar systems and enhancing its own missile systems with anti-missile missiles? (2) Do they really feel a threat from Iran? (3) Why is Iran building (if they indeed are) a missile with a range of a possible 1,900 miles? A. (1) America is putting pressure on Iran. Iran has no nuclear missiles at the moment and claims not to be planning to make them, but America is trying to force Iran to give up any such ambition and is using all methods, except, so far, the use of force to gain its will. It has fears that North Korea likewise might drop nuclear missiles on the USA (or South Korea or Japan) and is seeking every possible means of ensuring its own security even at the expense of Poland and the Czech Republic. Seventy per cent of the people of these countries have voted and made known their opposition to such plans. (2) No, I don’t think they do. They want to deny Iran any nuclear hardware. (3) Iran feels threatened by America and Israel, and feels the right to defend itself against any such threat. Q. Is it beneficial to have gratitude in life and even take time to say ‘thank you’, even if it’s to no one in particular, for the little things in life such as having a pleasant trip or a parking space becoming available to you when it is needed, etc? A. Yes, gratitude is one of the more important lubricants of right human relationship. On the whole, we take everything we receive in life for granted, without realizing that it all comes from the same divine source, of which we, ourselves, are a part. Q. How dangerous for our health are UMTS mobile masts? The office where I work is on the fifth and highest floor. The roof of the building is covered with a lot of masts, so my colleagues and I are exposed to this radiation. (1) Is there a reason for us to worry about these masts? (2) Recently all UMTS masts were removed from a primary school in the west of Amsterdam after two children and a co-worker died because of a brain tumour. Is it possible that these brain tumours were caused by the UMTS masts? (3) Are there other diseases which can be caused by this new technology? (4) Is there a risk from exposure to Wi-fi (wireless fidelity) computer internet networks? A. (1) No. (2) Very unlikely. (3) The risk is low. (4) Not really. Very minor, if at all. Q. Benjamin Creme has been touting the coming of Maitreya for over 20 years, since I was at university in 1987, or probably longer. What’s taking him so long? How do you guys differ from the fundamentalist Christians who say the Second Coming is “Any Day Now”? No one is coming to help us, teach us, or save us. The planet as we know it is doomed. Mass population extinction is coming, human and nonhuman. Buy some land, and hunker down for the food and water wars. Stop dreaming. A. The delay in Maitreya’s open appearance is directly related to the readiness or otherwise of humanity’s desire and readiness for change. Only now has it become apparent that humanity sees no alternative to change and is beginning to take seriously the necessity for doing so. As for your advice to humanity, you are welcome to follow it yourself but you are going to be very surprised. Q. After reading your information regarding so-called UFOs being from Mars and Venus, I wonder how this can be possible. The surface temperature of Venus is over 800 degrees Fahrenheit. Mars has been photographed by satellite for a number of years and recent probes have found no sign of life. However, I can see how this would be possible if the UFOs were from a higher dimension than the physical, emotional, and higher mental planes and were able to step down from that higher dimension (plane) into the physical (world). Is that what has happened? A. Yes, this is almost precisely what happens. The physical plane, as understood by our scientists, has three levels only: solid, liquid and gaseous physical. In fact, it has seven levels, the top four being etheric, and to our sight invisible. To Martians, Venusians and other Space Brothers, they are not only visible but are their normal, physical level of being. The UFO vehicles are also made of etheric energy and would normally be invisible; but they do lower the vibration of the atoms of the vehicles to bring them in range of our sight. This is a temporary manifestation only. Q. (1) Is there less prana and etheric energy in large cities than in the countryside? (2) Is there more prana in certain climates? A. (1) No, usually the opposite is the case. That is why large cities grow as chakras (force centres) of the planet. (2) Yes. Generally speaking, in dry, sunny climates. During the intermission of the New York City lecture of 28 July 2007, while I was staffing the literature tables, a man came up and asked me some questions. He was dressed in a bright orange t-shirt with the word “Miami” on the front. He had grey or white hair and a beard, but what stood out was his complexion, which seemed very orange. He asked me about the physical appearances of Maitreya. I said that he can look like anyone, a man or woman, young or old. He asked: “Does that mean Maitreya is from another galaxy?” “No, He is from our human family,” I answered. “He is just more evolved and can manifest the powers of the soul that are in each of us.” The man pointed to the photo of Maitreya as He appeared in Nairobi and asked about that. He then asked if I knew of the latest appearance. I directed him to Share International magazine, which documents Maitreya’s appearances throughout the world. That answer didn’t seem to satisfy him, so he asked me again about the latest Maitreya appearance. Smiling, I said: “According to our information, He is here at this event.” At that point, I mentally asked the question: “Is that you, Maitreya?” Smiling, he winked and left the tables. Was he a Master? MMT, Brooklyn, New York, USA. The rest of the evening there was a very high level of interest in Maitreya’s Hand and I explained it to many people and gave away many copies. I also had a sense that I had a great amount of support. I was working at the free literature table by myself. There have been times at lectures past when dealing with that many people at once could become overwhelming. This time it did not. I was able to handle the crowd, the questions and the requests with great ease. I felt the energy and support of Maitreya and the Masters the entire time and it was a very joyful experience. I felt a strong love and connection to everyone who approached the table – as if they were all members of my family. Was the older woman Maitreya and the younger woman the Master Jesus? A.S., Sound Beach, New York, USA. On 20 May 2006, three of us co-workers from the London Transmission Meditation group attended a rally at Trafalgar Square which supported the Palestinian cause. An unusually outspoken Bishop gave an impassioned, rousing speech about the need for justice to create peace in the world. Suddenly, an elderly, white-haired lady standing close to Gill (who had been blowing her whistle enthusiastically), turned around and spoke warmly to her, shaking her by the hand with such pleasure we thought she must know her. She was well-spoken, and had an air of a ‘blue-stocking’. She wore a smart two-piece suit and a large cross around her neck. She gestured to our banners, agreeing with the sentiment, saying to Idina: “A little higher, my dear.” As she passed me she said: “Quite right”. Then she was gone. Our banners all had the words “Only sharing and justice will bring peace” written on them. Could you kindly tell us if she was a Master? S.P., Ashurst Wood, Sussex, UK. Exactly as predicted, this year has seen an impressive number of reports of UFOs in many parts of the world and an increase in the crop circle phenomena, with ever new and various forms of patterns. A Canadian man photographed four white oblong shapes in the sky on 29 July 2007. Scott Fraser, a resident of Orillia, Ontario, said the shapes burst like rockets over the western horizon then rose vertically before moving south at high speed. Dozens of people in the town of Stratford-Upon-Avon, England, saw five UFOs in the sky on 21 July 2007. Crowds gathered to view the objects hovering in formation for about 30 minutes. The lights became visible at about 10.30 pm. Witnesses said the speed of the objects was unlike any known aircraft and that the unusual movement patterns, lack of noise and the length of time in the air discounted the possibility of a man-made phenomenon. One witness said: “We walked outside and there was at that time a growing crowd of about 60 people looking up at something in the sky. I saw a light appear, then three others. They came over our heads in formation but then moved into different positions. Three had formed a triangular shape and one was to the right. Then another one came hurtling towards the rest at what looked like a very fast speed. But as it neared them it suddenly slowed and stopped altogether. 2007 has been a great year for crop circle formations in the UK. By mid-August 47 patterns had been reported. While mainstream media has never investigated the phenomenon seriously, websites record the latest news and photographs of patterns. Thousands of people travel each summer to Wiltshire, southern England, to visit the crop circles. So far this year 88 crop circles, of increasing intricacy, have also been reported in other parts of the world: Germany (18); Netherlands (13), Czech Republic (1), Slovenia (3), Norway (2), Poland (2), France (1), Switzerland (6), Croatia (1), USA (6), Italy (22), Belgium (11) and Sweden (2). It is not the first time that miracles have occurred in fruit or vegetables and certainly not the last – but for Felicia Teske it must have seemed like the all-time miracle when she read the word “GOD” formed by seeds in an aubergine [eggplant] she had just started slicing. Ms Teske, of Boothwyn, Delaware County, Pennsylvania, USA, was preparing dinner on 12 August 2007 when she noticed “GOD” spelled out in capital letters on one slice of the vegetable. She showed the sliced eggplant to her husband Paul who decided to call local media – Action News. ‘Handprints’ have miraculously appeared on car windows and a bathtub in Japan in recent months. On 4 May 2007 Tetsuo Yokoe from Shiga photographed two ‘handprints’ on the rear window of his car. On 6 May 2007 Mika Yoshihara from Tokyo photographed a ‘handprint’ at the bottom of her bathtub. In June 2007 Hitomi Nishimura from Gifu washed her car and cleaned the windows. The next day she discovered four ‘handprints’ on her car: on the front glass, and window on the driver’s side. Karen Armstrong, the British theologian and author of numerous books on the great religions, has advanced the theory that fundamentalist religion is a response to and product of modern culture. A Catholic nun for seven years, she left her order while studying at Oxford University. She is one of the 18 leading group members of the Alliance of Civilizations, an initiative of the former UN General Secretary Kofi Annan, with the purpose of fighting extremism and furthering dialogue between the Western and Islamic worlds. 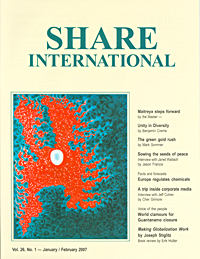 Andrea Bistrich interviewed her for Share International. Share International: 9/11 has become the symbol of major hostilities between Islam and the West. After the attacks many Americans asked: “Why do they hate us?” And experts in numerous roundtable talks debated if Islam is an inherently violent religion. Is it? Karen Armstrong: There is far more violence in the Bible than in the Qur’an; the idea that Islam imposed itself by the sword is a Western fiction, fabricated during the time of the Crusades when, in fact, it was Western Christians who were fighting brutal holy wars against Islam. The Qur’an forbids aggressive warfare and permits war only in self-defence. The moment the enemy sues for peace, the Qur’an insists that Muslims must lay down their arms and accept whatever terms are offered, even if they are disadvantageous. Later Muslim law forbade Muslims to attack a country where Muslims were permitted to practice their faith freely; the killing of civilians was prohibited, as were the destruction of property and the use of fire in warfare. SI: Despite such interdictions in the Qur’an some Muslims have become murderers. How can people be religious and yet be willing to blow themselves up and kill others in the name of Allah ? KA: To kill a single human being violates the principles of every single religion, including Islam. Terrorism is an unreligious act. Muslims have repeatedly disowned the terrorists, but this is rarely reported in the Western media. Terror is a political act, which may use (or abuse) the language of religion, but it absorbs some of the nihilistic violence of modernity, which has created self-destructive nuclear weapons and still threatens to use them today. An important survey showed that every single suicide bombing since the 1980s was politically rather than religiously motivated: the main grievance was the occupation by the West and its allies of Muslim lands. SI: The sense of polarization has been sharpened by recent controversies – the Danish cartoons of the Prophet Mohammed, the Pope’s remarks about Islam, the issue of face-veils and whether they hinder integration. Harvard-Professor Samuel Huntington introduced the notion of a “clash of civilizations”. Are the “Christian West” and the “Muslim World” fundamentally incompatible? KA: The divisions in our world are not the result of religion or culture but are politically based. There is an imbalance of power in the world, and the powerless are beginning to challenge the hegemony of the “Great Powers”, declaring their independence of them – often using religious language to do so. A lot of what we call “fundamentalism” can often be seen as a religious form of nationalism, an assertion of identity. The old 19th century European nationalist ideal has become tarnished and has always been foreign to the Middle East. In the Muslim world, people are redefining themselves according to their religion in an attempt to return to their roots after the great colonialist disruption. SI: What has made fundamentalism so apparently predominant today? KA: The militant piety that we call “fundamentalism” erupted in every single major world faith in the course of the 20th century. There is fundamentalist Buddhism, Christianity, Judaism, Sikhism, Hinduism and Confucianism as well as fundamentalist Islam. Of the three monotheistic religions – Judaism, Christianity and Islam – Islam was the last to develop a fundamentalist strain during the 1960s. Fundamentalism represents a revolt against secular modern society, which separates religion and politics. Wherever a Western secularist government is established, a religious counter-culturalist protest movement rises up alongside it in conscious rejection. Fundamentalists want to bring God and religion from the sidelines to which they have been relegated in modern culture back to centre stage. All fundamentalism is rooted in a profound fear of annihilation; whether they are Jewish, Christian or Muslim, fundamentalists are convinced that secular or liberal society wants to wipe them out. This is not paranoid: Jewish fundamentalism took two major strides forward: one after the Nazi Holocaust, the second after the Yom Kippur War of 1973. In some parts of the Middle East, secularism was established so rapidly and aggressively that it was experienced as a lethal assault. SI: The fact that fundamentalism is also a phenomenon in politics was stressed recently by former US president Jimmy Carter when he voiced his concerns over the increasing merging of religion and state in the Bush administration, and the element of fundamentalism in the White House. Carter sees traits of religious fundamentalists are also applicable to neo-conservatives: “... they are led by authoritarian males who consider themselves superior to others; they believe the past is better than the present; they draw distinctions between themselves, as true believers, and others; those who oppose their position are seen as evil; ... their self-definitions are narrow and restricted; they isolate themselves; ... they view negotiation and efforts to resolve differences as signs of weakness ...”, Carter writes. There seems to be a major conflict between, on the one hand, the hard-liners or conservatives, and on the other the progressives. Is this a typical phenomenon of today’s world? SI: Could you expand on the political reasons causing the growing divide between Muslim and Western societies? KA: In the Middle East, modernization has been impeded by the Arab/Israeli conflict, which has become symbolic to Christian, Jewish and Muslim fundamentalists and is the bleeding heart of the problem. Unless a just political solution can be found that is satisfactory to everybody¸ there is no hope of peace. There is also the problem of oil, which has made some of these countries the target of Western greed. In the West, in order to preserve our strategic position and cheap oil supply, we have often supported rulers – such as the shahs of Iran, the Saudis and, initially, Saddam Hussein – who have established dictatorial regimes which suppressed any normal opposition. The only place where people felt free to express their distress has been the mosque. The modern world has been very violent. Between 1914 and 1945, 70 million people died in Europe as a result of war. We should not be surprised that modern religion has become violent too; it often mimics the violence preached by secular politicians. Most of the violence and terror that concerns us in the Muslim world has grown up in regions where warfare, displacement and conflict have been traumatic and have even become chronic: the Middle East, Palestine, Afghanistan, Pakistan, Kashmir…. Refugees International has been a “global voice for the world’s dispossessed” for almost 30 years. Based in Washington DC, this nongovernmental organization (NGO) relies on a combination of advocacy and action to speak up for and protect the rights of refugees around the world. The group was founded in 1979, along with its sister organization Refugees International Japan, by an American housewife living in Japan, to advocate for the protection of Southeast Asian refugees, particularly from Vietnam and Cambodia. Today Refugee International’s advocates meet with war-affected populations, aid agencies and other NGOs around the world and bring what they have learned to policymakers at the United Nations and in the United States in order to motivate action on behalf of refugees and internally displaced people. Kenneth Bacon, former US Assistant Secretary of Defense for Public Affairs and Pentagon Spokesman, is president of Refugees International. He was interviewed for Share International by Jason Francis. Share International: What defines someone as a refugee or an internally displaced person? Kenneth Bacon: A refugee is someone who has crossed international borders to escape persecution. Generally persecution is based on religion, ethnicity, politics, race and so on. In fact, most refugees flee their countries to escape conflict, which produces the largest number of refugees. An internally displaced person frequently is somebody who has also left his or her home to escape conflict, but does not cross international borders. Many more protections apply to refugees under the 1951 Refugee Convention. The primary protection they receive is the protection against being sent home against their will. Often referred to by the French word non-refoulement, this international law stipulates that refugees may not be sent against their will back to a place that is still considered dangerous to live in. There is an international aid system designed to deal with refugees. Internally displaced people have almost exactly the same problems but without the same protection. SI: What nations are most affected by the refugee crisis? KB: The new figures will probably show that there are about 30 to 35 million displaced people throughout the world. [not including figures for ‘climate refugees’ whose numbers have increased drastically in recent months due to flooding and drought.] About one-third are refugees, while two-thirds are internally displaced people. So there are twice as many internally displaced people as there are official refugees. In Sudan, for instance, there are about 2 to 2.2 million internally displaced people, who tend to live in huge camps in Darfur. Some camps hold up to 90,000 people; there’s even one with 135,000 people. They’ve left their villages and farms in order to find safety inside these large camps. By contrast there are about 200,000 refugees who have fled Sudan for Chad. So the fighting in Darfur has generated over 2 million internally displaced people and 200,000 refugees. In Sudan there is yet another internal conflict going on between rebel groups in southern Sudan and the government. This civil war ended officially in 2005 when they signed a comprehensive peace agreement. Before the war was over there were 4 million internally displaced people, who had left southern Sudan and moved to other parts of the country, such as Khartoum, the capital of Sudan. There were also about 500,000 refugees who moved to Kenya, Ethiopia, Uganda and several other countries. There again, the number of internally displaced people dwarfed the number of refugees. SI: What area of the world is generating the fastest growing number of refugees? KB: Iraqi refugees are the fastest growing refugee population today. There are now 2.2 million refugees from Iraq — most of whom have relocated to either Syria or Jordan — and also 2 million internally displaced people in Iraq. In the northern hemisphere, drug wars have caused the most acute displacement crisis to occur in and around Colombia. There are approximately 3 million internally displaced Colombians. I don’t have the exact figure, but I know there is a much smaller number of refugees who have left the country. The 11th Hour is a feature film documentary co-written, produced and narrated by Leonardo DiCaprio on the state of the natural environment. Directed and co-written by Leila Conners Petersen and Nadia Conners it was released in August 2007. The 11th Hour is a gripping, 91-minute visual encapsulation of humanity’s impact on its home planet from the earliest times to the present day, even projecting into the future. In the present, we see drought, famine, flooding, hurricanes, disappearing forests, widening deserts, polluted air and oceans, species extinction, and melting arctic ice. The premise of the film is that we are at the 11th hour, the very last moment when change is possible, and viewers of the film experience that reality at a visceral level. Over 70 scientists, historians, environmentalists, and thinkers were interviewed to provide documentation for what DiCaprio calls the greatest challenge of our time – the collapse of our planet’s ecosystems and the search for solutions to create a sustainable future. Brief clips from some of these interviews are dramatically interwoven with visual panoramas of earth’s beauty as well as its devastation. We hear from scientist Stephen Hawking; Lester Brown, President of Earth Policy Institute; Mikhail Gorbachev, founder of Green Cross International; Paolo Soleri, architect and founder of Arcosanti; Janine Benyus, author and expert on biomimicry; author and environmentalist Paul Hawken; and Wade Davis, National Geographic Society explorer, among others. Each shares his or her thoughts on the state of the earth and how to restore the planet to health. The Industrial Revolution, the film suggests, was the turning point when humanity separated itself from nature – when the earth came to be seen as an eternally abundant resource to be exploited, rather than a precious, finite gift to be protected and preserved. And now, after 200 years of industrial revolution, we find ourselves standing at the brink of disaster in a convergence of crises. Rallies and sit-ins were held in more than 40 countries to highlight lack of action toward achieving the Millennium Development Goals (MDGs). The goals are a series of targets set by the international community in 2000 to reduce poverty, illiteracy, disease, and environmental degradation by 2015. Demonstrations took place throughout the world on 7 July 2007, demanding that governments take urgent steps to meet the goals. “We are always reminded that the growth rate of African economies has improved, but the reality shows that poverty is increasing,” said Christophe Zoungrana of the Global Call to Action Against Poverty (GCAP), an alliance of anti-poverty groups that co-ordinated the worldwide protests. UN Secretary-General Ban Ki-Moon indicated that most developed countries have failed to live up to their international aid commitments. “The lack of any significant increase in Official Development Assistance since 2004 makes it impossible, even for well-governed countries, to meet the MDGs,” the Secretary-General said. The G8 nations pledged to double aid to Africa by 2010 at their annual meeting in 2005, but total official aid declined in real terms by 5.1 per cent between 2005 and 2006. “There is a clear need for political leaders to take urgent and concerted action,” the UN chief said. A series of concerts, reaching an estimated worldwide audience of 2 billion, was held across the globe on 7 July 2007 to highlight the crisis of climate change. Organized by former US Vice President and author of An Inconvenient Truth Al Gore and Live 8 executive producer Kevin Wall, the Live Earth event aimed to “use the global reach of music to engage people on a mass scale to combat our climate crisis”. The concerts were held in stadiums in New York, London, Johannesburg, Rio de Janeiro, Shanghai, Tokyo, Sydney and Hamburg and were linked by satellite to millions of television viewers across the world. Artists included Duran Duran, Crowded House, Baaba Maal, Madonna, Soler, Linkin Park and Black Eyed Peas. During the concerts people were asked to support a ‘7-point pledge’ which included individual actions such as “reducing my own CO2 pollution as much as I can” and working for a “dramatic increase in the energy efficiency of my home”, as well as promises to demand governments to work to stop the crisis.